Wanderers came away from The County Ground with an emphatic 3-0 victory to leapfrog Swindon in the Division Two table. Fielding another unchanged line-up it was Keith Ryan who opened the scoring after 24 minutes when he followed up a Steve Brown header that had rebounded off the woodwork after Danny Bulman had centered and Craig Faulconbridge headed back. A clinical breakaway goal in the 57th minute then gave Wycombe some breathing space. Bulman started the move when he sent away Stuart Roberts and the Welshman repaid the compliment by crossing the ball in from the right side of the penalty area where Bulman drilled the ball home righted footed into the corner of the net. Danny Invincibile came closest to pulling one back for the home side just moments after Bulman's goals when a 30 yard effort smashed against Frank Talia's crossbar. The ex-Town 'keeper received plenty of stick from the home fans but he had the last laugh as, along with the Wycombe defence, any threat of a comeback was thwarted. Jermaine McSporran was introduced as a substitute in 66th minute for his first taste of First Team action since April 2002 and he saw Wycombe clinch the game with a third goal when Brown's corner from the right was headed home by Faulconbridge from around six yards to register his first goal since he scored against Swindon at Adams Park back in November. McSporran was joined in the later stages by fellow injury victim Gavin Holligan as Wanderers completed their first ever Football League victory over Swindon. This result will come as another confidence booster for Wanderers and when Faulconbridge was mobbed by his team-mates following the end to his goal drought it re-instated the newly found team spirit throughout the squad. It was Faulconbridge who had the first real effort on goal after 8 minutes but Bart Griemink saved. At the other it was Danny Invicibile, playing in an unfamiliar striker role, that pose the most threat to Wycombe. Talia saved from the former Wycombe transfer target after 13 minutes and the same player was denied again by Talia following a free-kick by Andy Gurney. But it was Wycombe who got the first crucial goal and there was no turning back. Steve Brown will probably think he should have scored after Faulconbridge had headed back but it was fellow "thirtysomething" Keith Ryan who was on hand to forced the ball home from close range. Wycombe have become a difficult side to beat once they get ahead and this game proved no exception. Gurney saw a free-kick saved on 55 minutes but a minute later Wanderers doubled their lead with a classic breakaway goal finished off by Danny Bulman. If Invincibile's effort had gone in just moments after Bulman's goal it may have been a different story but Wanderers finished the game in very comfortbale fashion. 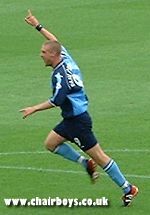 Faulconbridge's goal was greeted with mass celebration by the Wycombe players and by the dedicated band of supporters who hadn't been put off by Swindon's inflated entrance prices. Swindon had a few chances at the end but by this time the result was never in any doubt and even Premiership referee Mark Halsey didn't seem that bothered in extending the pain for the home team. He added just a minute of stoppage time on and then blew at the first opportunity when another Swindon move broke down. The result moves Wycombe up one place in the Division Two table to 11th with 42 points from 32 games but ten points shy compared to the same stage the previous season. All match reports © 1996, 1997, 1998, 1999,2000, 2001, 2002, 2003 Chairboys on the Net (www.chairboys.co.uk) - Not to be reproduced without our written permission.